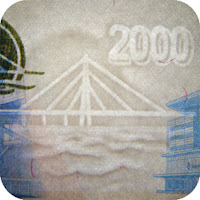 The front of the note features the Russky bridge (a cable bridge in Vladivostok that connects Russky Island with the mainland territory). 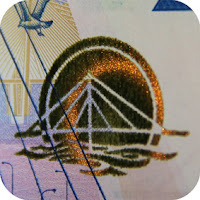 The top left corner of the front of the note bears the coat of arms of the Russian Federation. On the front of the note, at the bottom, there is a QR-code which contains a link to the website of the Bank of Russia. The link leads to the description of the note’s security features. The back of the note features the Vostochny Cosmodrome. The top right corner of the back of the note bears the inscription ‘2017’ (the year when the note was issued). On the back of the note, there are two serial numbers that consist of two letters indicating the series followed by nine digits. The left number is printed on the short side of the note, the right number on the long one. 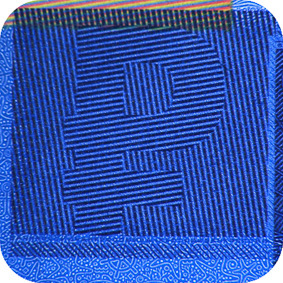 Predominant colour of the note is blue. The note is printed on white cotton paper. 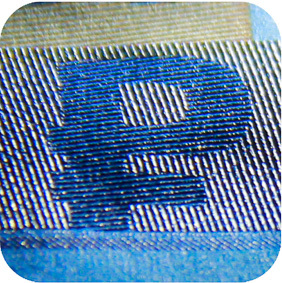 The banknote paper contains two types of security fibres: coloured, with alternate sections of red and blue, and grey ones. There is a 5-mm wide holographic security thread embedded in the paper. The thread comes out on the surface on the front of the note through three windows. Dimensions 157 x 69 mm. 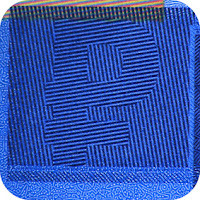 Multitone combined watermark: The multitone combined watermark is located on the unprinted area of the right side of the note and becomes visible when checked in transmitted light. It features a stylised image of the bridge against the sun and the number 2000 and is done with smooth transitions from light to dark in combination with contrasting highlight areas. Optically variable magnetic element Spark: When the banknote is tilted, a moving bright glossy circle appears on the stylised images of the bridge and the sun. Security thread: When the banknote is tilted, separate digits of the note’s value numeral can be seen moving left and right on sections of the security thread that come out on the surface of the note. At an acute angle colour images of the ruble symbol become visible on a coloured background. The 3D image of the ruble symbol between the images of the value is constantly visible. Latent image of the ruble symbol: When the note is viewed at an acute angle, the ruble symbol becomes visible. Depending on the position of the note, the symbol appears light on a dark background or dark on a light background. The Russky Bridge (Russian: Русский мост, Russian Bridge) is a cable-stayed bridge in Vladivostok, Primorsky Krai, Russia. The bridge connects the Russky Island and the Muravyov-Amursky Peninsula sections of the city across the Eastern Bosphorus strait, and with a central span of 1,104 metres (3,622 feet) it is the longest cable-stayed bridge in the world. The Russky Bridge was originally built to serve the 2012 Asia-Pacific Economic Cooperation conference hosted at the Far Eastern Federal University campus on Russky Island. It was completed in July 2012 and opened by Prime Minister Dmitry Medvedev, and on September 3, 2012, the bridge was officially given its name. The bridge to Russky Island is the world's longest cable-stayed bridge, with a 1104 m long central span. The bridge also has the second highest pylons after the Millau Viaduct and the longest cable stays. - Shortest coast-to-coast distance in the bridge crossing location 1460 m. Navigable channel depth is up to 50 m.
- The locality of the bridge crossing construction site is characterized by severe climate conditions: temperatures vary from -31 °C to 37 °C; storms bring winds of up to 36 m/s and waves of up to 6 m in height; and ice formations in winter can be up to 70 cm thick. The piles were driven as deep as 77 m below ground and on the island side 120 auger piles were piled under each of the two 320 m high bridge towers. The pylons were concreted using custom self-climbing forms in pours of 4.5 m. A crane was used on the first three pours, afterwards the formwork was completed unaided moving through the hydraulic motion of modular elements. The pylons are A-shaped, therefore, the use of standard forms was not feasible. An individual set of forms was arranged for each bridge tower. Transition between section types was carried out at summer levels at the elevations of 66.26 m and 191.48 m.
The use of self-climbing forms made it possible to achieve better quality and decrease the time of construction of cast-in-situ reinforced concrete structures by half as much again. The cable stays anchorage zone starts at 197.5 m. The installation of cable stay pairs and casting of bridge tower bodies was carried out simultaneously, dramatically reducing the construction period. The span structure has an aerodynamic cross-section to assume squally wind loads. The shape of the span cross-section has been determined based on aerodynamic design and optimized according to the results of experimental processing of the scale model in the detailed design phase. Welded field connections are used for longitudinal and transversal joints of the cap sheet of the orthotropic deck and lower ribbed plate. For joints of vertical walls of the blocks, longitudinal ribs, transversal beams and diaphragms, field connections are used provided by means of high-strength bolts. Large-sized prefabricated sections for the installation of the central span were delivered by barges to the erection site and hoisted by a crane to a 76 m height. Here, the elements were abutted and cable stays attached to them. A cable-stayed system assumes all static and dynamic loads on which the very existence of the bridge depends. Cable stays are not designed to endure the entire lifetime of the bridge, but they are repairable and have the best possible protection from natural disasters and other adverse impacts. PSS cable stays consist of parallel strands of 15.7 mm diameter; every strand consists of seven galvanized wires. Cable stays incorporate from 13 to 79 strands. The length of the shortest cable stay is 135.771 m; the longest, 579.83 m. The protective housings of the cable stays are made from HDPE and have the following features: UV resistance; resistance to local climate conditions of Vladivostok (temperature range from minus 40 °C to plus 40 °C) and environmental aggressiveness. Russky Island (Russian: Ру́сский о́стров, lit. Russian Island) is an island in Peter the Great Gulf in the Sea of Japan, in the city of Vladivostok, Primorsky Krai, Russia. It is the largest island in the Eugénie Archipelago, separated from the Muravyov-Amursky Peninsula immediately to the north by the Eastern Bosphorus, and is one of the four islands in Primorsky Krai that are permanently inhabited with a population of 5360 (2010). Russky Island is home to Far Eastern Federal University and the southern span of the Russky Bridge, the world's longest cable-stayed bridge, connecting the island across the Eastern Bosphorus to the mainland portion of Vladivostok. Russky Island is located about 9,334 kilometres east of Moscow, the capital of Russia. It is the largest island in Primorsky Krai, with about a quarter of its area being the Saperny Peninsula, which forms much of the north and east of the island, and the closest part to the mainland. Novik Bay is a long and thin bay located between the Saperny Peninsula and the remainder of the island. Russky Island is the largest and northernmost island in the Eugénie Archipelago, a cluster of small islands and islets south of the Muravyov-Amursky Peninsula that extend to the southwest for about 40 km. Major neighboring islands in the archipelago include Shkot Island to the south, Popov Island (7 km long, 4.3 km wide), Reyneke Island (3.4 km across), and Rikord Island (4.1 km long and less than 2 km wide) to the south-west. There are many small islets and sea stacks scattered between them. Shkot Island is the only island in the archipelago connected to Russky Island by land, as a thin isthmus forms a land bridge during low tide. Russky Mountain, 291 meters above sea level, is the highest point of Russky Island and the Eugénie Archipelago, and one of the highest peaks of Vladivostok. It is located in the northern part of the island, near the south-western shore of the Novik Bay. The source of the Russky River is on the southern slope of the mountain. The first map to feature Russky Island was published in Russia in 1859, although only the western and northern shores of the island were shown. It became a part of the Russian Empire the follow year in 1860 after the Convention of Peking, when it was ceded by Qing China as part of the region unofficially known as Outer Manchuria. The island was named Russky Island, meaning "Russian Island", by Nikolay Muravyov-Amursky, the Governor-General of Eastern Siberia. The island was charted in its entirety by an expedition lead by the cartographer Lieutenant Colonel Vasily Babkin in 1862, as part of the survey of Peter the Great gulf after its acquisition. A map featuring the whole island was published in 1865 with the name Kazakevich Island, in honour of Petr Kazakevich, the military governor of Primorskaya Oblast. Russky Island and Kazakevich Island was both used interchangeably until after World War II, when it was permanently changed to only Russky Island. By 1889, Fort Pospelov had been built on the island as part of the Vladivostok Fortress complex, as developed by Colonel K. I. Velichko. Over several years, the initial temporary wooden structures were gradually replaced with stone structures. Fort Russky was built on Russky Mountain, near the highest point on the island, between 1898 to 1903. The fort was built in an irregular trapezoid shape, with numerous artillery batteries which were meant to be able to fire into almost all the bays of Russky island in case of invasion. During the Soviet era the island was a closed territory and was home to several military installations, and became one of the largest training areas for the Soviet Navy. In 1992, Russky Island became the scene of a political scandal when four soldiers of the Russian Navy serving at an isolated garrison on the island starved to death and dozens of others were hospitalized suffering from the effects of starvation. Their commanders had failed to send them rations for months, and the matter became a national scandal regarding the state of the armed forces. In 2002, the St. Seraphim Monastery, a monastery belonging to the Vladivostok diocese of the Russian Orthodox Church, was built on the island. Development of Russky Island is linked to Russia's response to growing Chinese economic power in the region, and the opportunity of the Chinese market. The 2012 Asia-Pacific Economic Cooperation summit was held on Russky Island and about $US6 billion was set aside for the development of the island and Vladivostok in preparation for the summit and construction of the site for the 2012 APEC conference that was also planned and built as a new campus for the Far Eastern Federal University. Plans include the potential to develop the island as a large scale tourist resort, and the construction of the official residence of the Russian President in the Russian Far East in Boyarin Bay were approved by the APEC summit. The Russky Bridge between Russky Island and Vladivostok was completed in July 2012, and has the longest cable-stayed bridge span in the world at 1,104 metres (3,622 ft). The Vostochny Cosmodrome (Russian: Космодром Восточный Kosmodrom Vostochny "Eastern Spaceport") is a Russian spaceport under construction on the 51st parallel north in the Amur Oblast, in the Russian Far East. When completed in 2018, it is intended to reduce Russia's dependency on the Baikonur Cosmodrome in Kazakhstan. The first launch took place on 28 April 2016 at 02:01 UTC. As of November 2017, two launches were attempted from the cosmodrome, both failed. Russian president Vladimir Putin made several statements emphasizing the importance of the new cosmodrome. In August 2010, he said "The creation of a new space center ... is one of modern Russia's biggest and most ambitious projects". In January 2011, he ordered the government to complete the paperwork as soon as possible so that construction can start on schedule. The general designer of the cosmodrome is Ipromashprom (Mechanical Engineering Project Institute). The main contractor is the Federal Agency for Special Construction. Construction of the cosmodrome began in January 2011 and, as of 2011, was expected to be completed in 2018. During a visit to the site in July 2011, the newly appointed chief of Roskosmos, Vladimir Popovkin, promised 20 billion rubles for Vostochny during 2012. A month later, the head of Spetstroy, Grigory Naginsky told the press that the first blueprints for the center went through the project expertise and the first contract worth 1.6 billion rubles was signed with Roskosmos, covering the construction of the railway line and the road. Naginsky also promised the completion of the initial makeshift housing for construction workers at the site by 1 October 2011. Although the Angara pad at Vostochny had originally been planned for completion in 2018, as part of the second phase of the construction of the new launch center, Dmitry Rogozin announced in January 2013 that Angara would fly from Vostochny earlier, in 2015. In the event, however, Roskosmos announced in November 2014 a postponement, and that the first unmanned test mission of Angara would not launch until 2021. Over 100 construction workers went on strike to protest about unpaid wages in March and April 2015. Following corruption allegations and findings by the Russian Prosecutor General's Office that "a number of labor laws have been violated during the construction. [Vladimir Putin said he is] taking personal control of the cosmodrome's construction." In June 2015, the installation of the support equipment, assembly of the first floor of the command post of the Vostochny cosmodrome have been handed over to specialists of the Centre for Operation of Space Ground-Based Infrastructure (TsENKI). In October 2015, it was announced that parts of the assembly complex for the Soyuz-2 rocket were designed for a different variant of the rocket and are too small, so that the planned launch date of the first Soyuz-2 from Vostochny Cosmodrome in December 2015 was under question. A spokesperson for a Russian government space infrastructure agency reported that "Work with the rocket at the integration and testing complex now can not be conducted because the facility is not ready", and added that "there are still imperfections in the construction". However, later this information was disproved by the cosmodrome's operation centre and the rocket was set into the facility. Vostochny (which means "eastern" in Russian) is in the Svobodny and Shimanovsk districts of Amur Oblast in the Russian Far East, on the watershed of the Zeya and Bolshaya Pyora rivers, approximately 600–800 km (370–500 mi) from the Pacific Ocean, depending on launch azimuth. The planned total area is 551.5 km2, being a region approximately 30 km in diameter centred on 51.884395°N 128.333932°ECoordinates: 51.884395°N 128.333932°E. The nearby train station is Ledyanaya and the nearest city is Tsiolkovsky. The cosmodrome's latitude, 51° north, means that rockets will be able to carry almost the same amount of payload as they can when launched from Baikonur at 46°N. Other arguments for choosing this location include the ability to use sparsely populated areas and bodies of water for the rocket launch routes; proximity to major transportation networks such as the Baikal–Amur Mainline, the Chita–Khabarovsk Highway; abundance of electricity production resources in the area; and the infrastructure supporting the former Svobodny Cosmodrome, on which the new spaceport will be based. The site's location in the Russian far eastern region allows for easier transport of materials to the site, and allows rockets to jettison their lower stages over the ocean. It was expanded as part of the plan of modernization of the supporting infrastructure. Putin said that among places offered was an area on the shore of the Pacific Ocean, near Vladivostok, but that experts recommended not to locate it there since the proximity to the ocean can create problems and delays in launches, and as a result the current place was chosen. The new cosmodrome is to enable Russia to launch most missions from its own land, and to reduce Russia's dependency on the Baikonur Cosmodrome in Kazakhstan. Currently, Baikonur is the only launch site operated by Russia with the capability to launch crewed missions to ISS or elsewhere. The Russian government pays a yearly rent of $115 million to Kazakhstan for its usage. Satellites bound for geostationary orbit and high inclination orbits can be currently launched from Plesetsk Cosmodrome in northwestern Russia. The new site is intended mostly for civilian launches. Roscosmos plans to move 45% of Russia's space launches to Vostochny by 2020, while Baikonur's share will drop from 65% to 11%, and Plesetsk will account for 44 percent. In 2012, the share of space launches from Russia's territory stood at 25%. By 2030 this figure is projected to increase to 90%. The first launch at the complex occurred on 28 April 2016, at 02:01 UTC, when a Soyuz-2 launched from pad Site 1S, carrying the gamma-ray astronomy satellite Mikhailo Lomonosov. The second launch occurred on 28 November 2017, also from Site 1S, with a Soyuz-2.1b/Volga upper stage carrying Meteor-M No.2-1. Failure. Development of the Vostochny Cosmodrome is expected to have a positive impact on the economy of the relatively poorly developed Russian Far East. The Russian government has a strategic policy to bring high-tech companies into the Far East region, and several enterprises involved in human space flight are expected to move their activities there when the new cosmodrome is completed. The development of the new site is also expected to dramatically increase employment in the towns of Tsiolkovsky, Shimanovsk, Svobodny and others. According to a 2009 estimate, the construction will cost 400 billion rubles ($13.5 billion). Along with the launch pads and processing facilities, an airport and a satellite city will be constructed. The city will be designed to accommodate for 35,000 people as well as for tourists. It will contain a full supporting infrastructure with schools, kindergartens and clinics. Architect Dmitry Pshenichnikov has stated that the city is to become a "one-of-its-kind scientific and tourist space town with a unique design and a beautiful landscape". When completed, the cosmodrome will permanently employ 20,000–25,000 people. In November 2012, press reports indicated that the Russian government is having difficulty in finding a good use for the new spaceport, and that other government ministries have been avoiding the project while "calling the project a 'dolgostroy', which is Russian for an "endlessly being updated construct". - Site 1A (where A - Angara rocket family) – Angara-1.2/A5/A5P/A5V, launches beginning in 2021. - PU3 – (where PU (ПУ) stands for puskavaya ustanovka (пусковая установка) or "launch pad"), prospective super heavy-lift launch vehicle, launches beginning after 2023.